This long beach of about 3.500 metres long, extends from Los Alamos to the Guadalhorce river. If you go by car you’re bound to find a parking space without any problems and you’ll find all the necessary services for a beach. Around this area we’ll still come across areas with natural beaches with no promenade. To reach the San Julian beach, you must head towards Torremolinos on the N-340 and turn off at San Julian on the kilometre 232. This beach offers parking, first aid, bus stop nearby for those who prefer to go by bus and beach bars where they serve specially delicious seafood. Situated right next to the San Julian beach, opposite the urbanisation with the same name. This beach has a seafront promenade and a nearby bus stop for those who prefer to get there by bus. This beach begins on the eastern side of the Guadalhorce river. It has been improved over the last few years, its promenade is known to be one of the longest in Malaga and is used by many people for walking, jogging, cycling or rollerblading. It’s quite a wide beach, so we shouldn’t have any problems to place our towel and enjoy a fantastic day under the sun. It’s situated opposite the district under the same name and is accessible from the Antonio Machado seafront promenade. It’s a very popular beach amongst the locals during the summer months. It has a playground for the kids, restaurants, sunbeds to hire, rubbish bins and grass areas. Situated in La Malagueta area. Accessible by car and by bus. 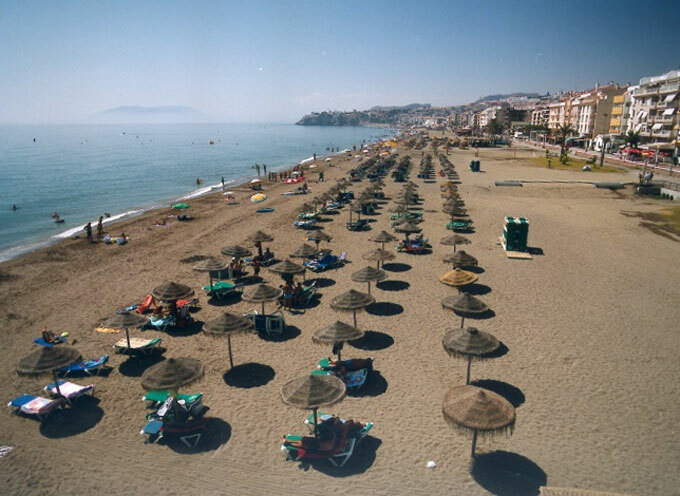 It’s one of the busiest beaches in summer due to its proximity to the centre of Malaga city. This well-known beach in Malaga has sand directly brought in from the Sahara to make it wider. It also has restaurants and beach bars, as well as large areas to do some exercise or rollerblade. 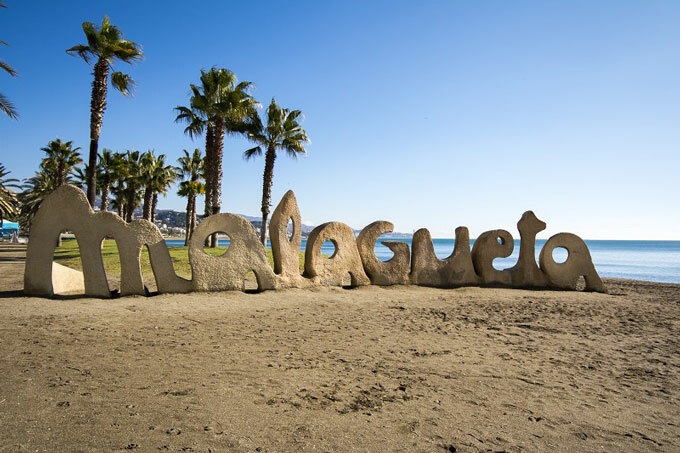 La Malagueta is one of those beaches that’s recommendable both by day and by night. This beach is situated along the Pablo Picasso seafront promenade and in the area under the same name. It’s a recommended beach for the whole family and offers all kinds of water sports. A perfect place to go for a walk and enjoy a great day on the beach. La Caleta beach has rubbish bins, showers, easy access from the motorway, sunbeds to hire and beach bars. A place with a history where in the olden days it had baths exclusively for the high-class society. Today, it’s one of the busiest and most popular beaches amongst the youngsters. Finding a parking spot near there is not easy but it’s easily easily accessible. Los Baños del Carmen beach is situated between the Pablo Picasso seafront and Pedregalejo. It offers parking, rubbish bins and local police. 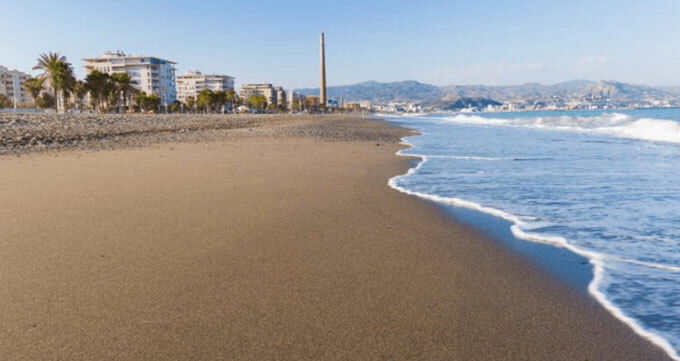 Situated in the centre of Malaga, that can be reached from the road that goes to El Palo, or by walking along the Pablo Picasso seafront promenade until you get there. This U-shaped beach is very popular amongst the locals and the tourists although it’s a large beach so there’s plenty of space for everyone to enjoy a wonderful day on the beach in the Pedregalejo area. The beach here in El Palo is a family beach, very similar to Las Acacias beach, that attracts many fishermen and scuba divers. It’s very easy to get to this beach in El Palo from Malaga centre, as it’s indicated quite clearly. Reaching this beach is very simple, all we need to do is follow the coast road towards the east and we’ll find it straight opposite a cement factory. It has a parking area, beach bars, sunbeds to hire, rubbish bins and public showers. This beach extends from Torre Paloma all the way to la Cala del Moral and it’s a great place to enjoy a day under the sun. The beach is situated in the town of the same name and is well connected with the city centre, so you can get there easily by car. To get to Rincon de la Victoria we must follow the road from Malaga towards Velez-Malaga where we’ll clearly see the entrance sign to Rincon de la Victoria and head down towards the sea. This beach offers a wide range of services like public showers, sea rescue, children’s playground, parking, etc.. It has a long seafront promenade that’s perfect for a nice walk, with cafes and restaurants, ideal for a great day out with the whole family. To reach this beach you must follow the N-340 road to Rincon de la Victoria and continue until reaching the Benagalbon Tower, on the road towards Almeria. As this article is being written, the Benagalbon beach remains a natural beach with very few services available. It’s perfect for a relaxed an peaceful day on the beach; plus, it has a nice little beach bar. Situated right next to the Rincon de la Victoria beach and the Benagalbon beach. This beach is over a kilometre long, has dark sand and is quite peaceful, with a few green areas that give it a very special touch. Los Rubios beach has some services available for the visitors and a beach bar to cool off with a cold drink or a bite to eat.